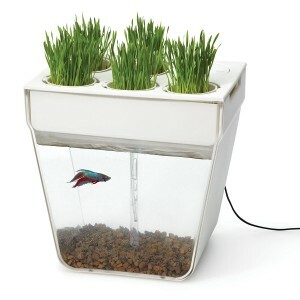 The double-decker combination of garden and fish bowl creates a symbiotic ecosystem. In the top tray, basil, mint, spinach, baby greens, and other edible or decorative plants thrive as nutrient-rich water is circulated past their roots. That process purifies the water, which is then sent back to the 3-gallon tank below, creating a happy, healthy habitat for a beta or goldfish.